If you’ve read some of our content at Tiller, you know that we care a lot about spending. We feel spending is often the linchpin that determines whether we’re financially free or distressed. Spending also defines us. Imagine someone from Mars coming down and observing you for the day. Sure they’d learn something from your email account and your Facebook page, but talk is cheap. We can say one thing but do another. When it comes to actions, our choices with our time and our money go a long way to creating our life. The Martian would learn the most by seeing how you spend your time and money. Add up those decisions over a few decades, and it’s a track record, nay, it’s a legacy. It’s your life! We’re big fans of New York Times columnist and author Carl Richards, and we’ve learned quite a bit from him. He has a similar perspective about money, and he is a snappy and smart voice in personal finance. He takes complex issues and turns them into concrete and actionable principles. With Carl’s encouragement and inspired by his values-driven approach to money, we’re excited to share our new Values-Driven Budgeting template. You’ll find it today among the other templates you can choose from when you create a new Tiller Sheet. If you’re not a Tiller customer you can try it out for free here. It’s one of our simplest templates. It captures your Transactions, allows you to choose whether or not an expense is aligned with your values, and then shows you a report card. That’s all. 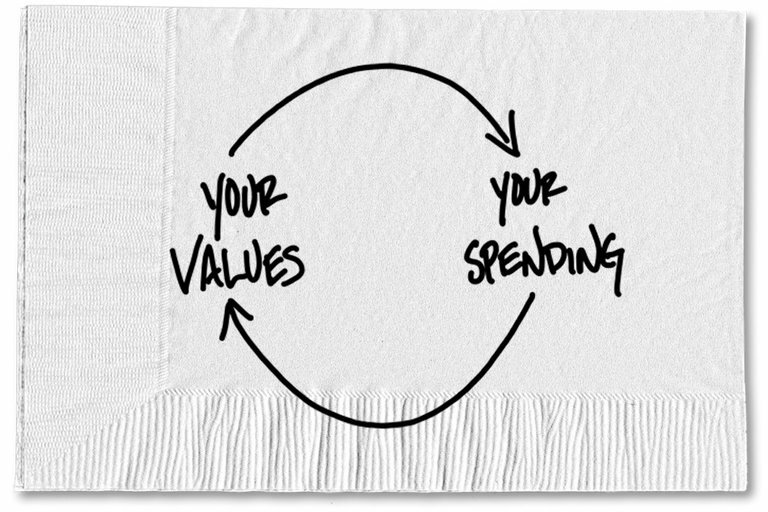 The power comes in the conversations that happen around spending and values. If you have a partner, invite them to join you. If you don’t, find a close friend who wants to take this challenge with you. Do it together for two months. Here’s an example Carl provided in his recent New York Times column. His friend Tim started tracking his expenses, reviewing them, and asking himself how well they align with his values. One thing he noticed was a $50 lunch. He recalled that each month, he and a close friend went out for a moderately expensive lunch to catch up. After thinking about it, he realized that the thing he intended to invest in during those lunches was not food or nutrition, but the friendship. And as far as the friendship goes, what he and his buddy really liked to do the most was go hiking, not eat out. 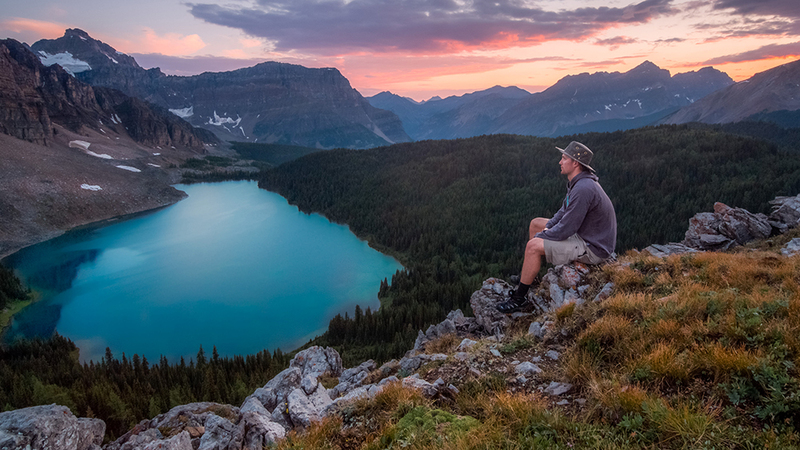 Tim called his buddy and asked how he would feel about changing their monthly lunch meeting to a monthly hike, and the friend was extremely enthusiastic. So no more fancy lunch. Now they make a couple of peanut butter sandwiches and go on a hike instead. Here’s the really interesting thing. After noticing that there was a better way he could invest in this value of friendship, Tim was able to free up $50 a month to invest in some other value. One of Tim’s values happens to be long-term financial security, so he took that $50 and invested it in an S.&P. 500 index mutual fund. This may sound a little bit like boring financial adviser talk, but it’s actually quite amazing. Just imagine if I told you that you could have an extra $50 and two hours each month to invest in things you really care about. Would you sign on the dotted line? I bet you would. What I think is particularly exciting about this approach is that it creates an opening for conversations between you and your partner, or a close friend, about money. Most of us aren’t well equipped to talk about money with others. We often get stuck in the mud. This exercise simplifies it. Lets not talk about cash flow, debt, retirement, and that vacation we want to take… yet. Let’s begin with observing and talking about our daily expenses. First, ask: what are our values? If you want help thinking about your values, here’s a list to get your gears turning. 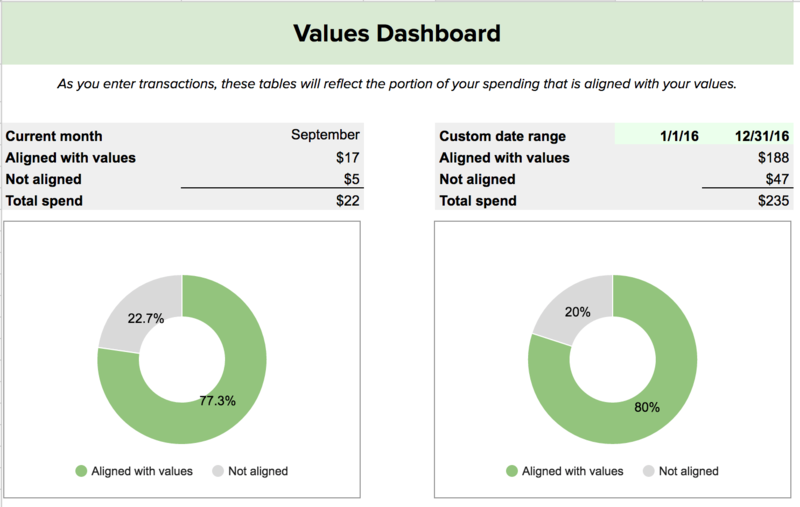 We even have a space in the Values-Driven budgeting template for you to list them out. Second, ask: do our expenses align with those values? The outcome of this exercise can be provocative at a minimum, but it holds the possibility of being incredibly impactful. If we start spending more of our money in ways that are consistent with our values, we’ll feel better about our money, and we’ll reinforce those values in our life. We’ll align with those values, and we’ll start developing a better vocabulary for talking about money with someone else who is important in our life. That’s powerful. Dive in, and let us know what you learn. We’d love to share your experiences in a future blog.